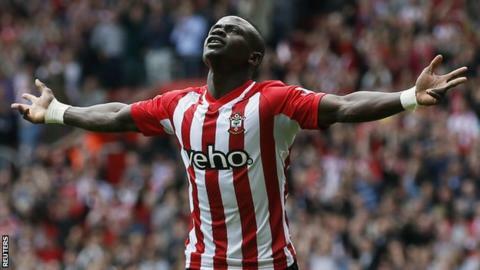 Southampton winger Sadio Mane described the fastest hat-trick in Premier League history as his "best moment in football". The Senegalese, 23, netted three goals in two minutes and 56 seconds in the 6-1 win against Aston Villa on Saturday. It surpasses Robbie Fowler's hat-trick of four minutes and 32 seconds for Liverpool against Arsenal on Sunday, 28 August 1994, aged just 19. "In Senegal they will be happy for me. I have many fans there," said Mane. The winger opened the scoring at St Mary's in the 13th minute and completed his trio of goals by the 16th minute. His first two had a touch of good fortune, putting away a ricochet off Villa keeper Shay Given, before latching on to a loose Ron Vlaar back-pass for his second. Then Mane, a summer signing from Salzburg, finished well from the edge of the area for his third to pour misery on Tim Sherwood's side. "I am happy. The most important thing today was the victory. It's a special day for that," Mane told BBC Radio Solent. "The last three weeks have not been easy but this is football, you have to work hard in training and this makes the game easy." Saints' other goals came via two strikes from Shane Long and a late volley from Graziano Pelle. Christian Benteke headed home his 15th goal of the season for Villa's only goal of the game. Manager Ronald Koeman, who took charge at Southampton in the summer, feels the best is yet to come from Mane. "I didn't have time to think about the hat trick because it was so fast," said Dutchman Koeman. "We know with Sadio and Shane we have fast people and if we get the space we had today then they will punish you. It's not normal to score a hat trick in three minutes, not in the Premier League and not in Holland. It was fantastic. "I speak a lot to Sadio, he has to know what his best quality is. "He is a scorer and today he demonstrated what we expect. He is a great player, it his first season in the Premier League, he is a young player and he will learn and get better because I believe in the talent of the player."